Really love Computer Programming? Expand your skills by participating in our Mastery Progression program where you advance through the listed courses to earn a Certificate of Mastery! Dash Bot and our Zaniac instructors teach you to code with Blockly! Learn the basics of using the Blockly coding language with some help from our robot Dash! Oh, and our most awesome Zaniac instructors, too! Blockly is an intuitive and visual way to learn how to code. Use Blockly to make emojis and gifs! Blockly editor uses interlocking, graphical blocks to represent code concepts like variables, logical expressions, loops, and more. Generate Blockly code and use your new skills for game-based coding challenges, as well as building and programming robots. For grades K-8. 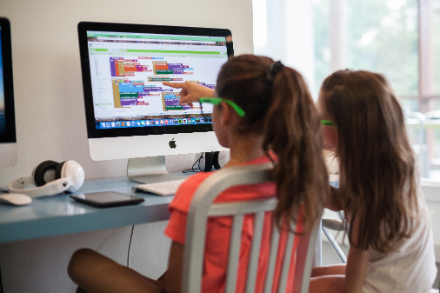 Intro to Scratch teaches programming concepts such as sequences, loops, iterative development, and debugging using a modern, block-based approach. Students create animations and videos to share with friends and family. No prior experience necessary. In Game Design, students create a new game every class and program classic games like Pac-man and more. Learn advanced concepts, such as broadcasting, variables, and adaptability while working on collaborative learning skills. *Intro to Scratch is a prerequisite for this course. In App Creation, students explore the software design process using App Inventor 2, a block-based, visual programming approach designed by MIT. Learn and use real development techniques like event handlers, timers, lists, database management, and script generation to go from concept to a functional application that is yours to keep. After class you can continue to develop your favorite apps at home, share them with friends via the App Inventor Gallery, and even sell them on the Google Play™ store! For grades 4-8. In Web Design, students create their own website, going all the way from concept to functional, hosted site. Learn the basics of the HTML5 and CSS3 web languages, layout strategies, color theory, and responsive web design. Start by brainstorming your initial concept, wireframing a template in Moqups, building in Weebly, and tweaking the HTML and CSS to dial in the design. Web Design students also learn about site maintenance, including UX feedback, testing, updates, domain management, and hosting. For grades 2-8. Python students work with an intuitive, syntax-based language and learn syntax-specific concepts like lists, strings, and conditions. Create the foundation of a functional platform game! For grades 4-8. In Game Modding, you’ll work with developer tools including JDK, Eclipse, Terminal, and Gimp to create custom items, blocks, and new materials by writing your own code in Java. Learn to install resource packs and pre existing mods, and interpret the elements of existing mods to define qualities for your own. For grades 4-8. In Intro to Java, students learn the basics of Java, a "write once, run everywhere" language. Explore principles like variables, classes, methods, code efficiency, and automation, all while building a text adventure game, a calculator, and more. For grades 4-8. *Intro to Scratch, Game Design, and Web Design are prerequisites for this course. Dive deeper into the Minecraft Coder Pack for more advanced approaches and create custom inventory tabs, biomes, crops, and unique armor. Build on what you learned in Intro to Minecraft Mods to create a brand new mod. *Intro to Minecraft Mods is a prerequisite for this course.